I have some experience of keeping cats – having had them for over twenty years – but when I contacted Anita about Holly I was at a total loss. 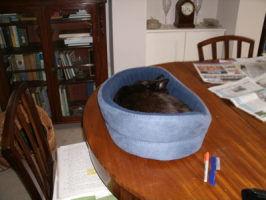 Holly is a rescue cat who was quite traumatised, and who would not go on to the floor at all – she effectively lived on my dining table. Anita did a home visit, and the advice she provided was invaluable in giving me guidance on how to move forward with my very anxious cat. From the point of Anita’s visit, things started to improve. I tried a range of activities advised by Anita, and gradually Holly gained confidence. She is still nervous but she moves around the house from the sitting room to the dining room and the bedroom, and she is beginning to show interest in the garden – something I never thought I’d see before consulting Anita. Holly is now so much happier. She wanders around the house, eats in the kitchen and uses the cat flap. Even as I email she is rushing around the garden playing….. She is still a nervous cat but is now really affectionate. You would not think she is the same cat as the petrified one that you came to see – Progress started after your first visit and has continued. Anita Walsh was happy with Anita Kelsey’s cat behaviour consultation and you will be too.